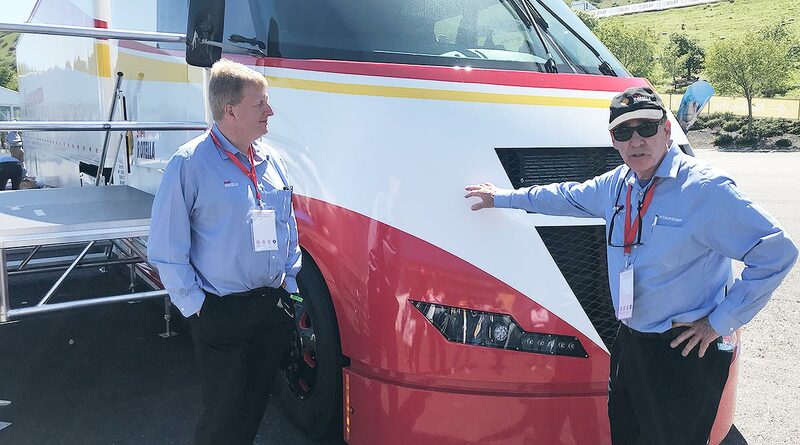 SONOMA, Calif. — Equipment manufacturers showcased new fuel-efficient Class 8 tractor technology during Shell’s “Make the Future” event at Sonoma Raceway on April 20. During the event here, executives from Shell Rotella and AirFlow Truck Co. discussed “Project Starship,” a one-of-a-kind fuel-efficient truck the companies debuted in March. “This Class 8 truck is proof that small improvements over time can make a significant impact in reducing emission and increasing efficiency,” Culpepper said at the event. The Starship uses a range of technologies to get maximum efficiency with reduced emissions. The Starship will embark on a fully loaded, cross-country trip in May, hauling reef material from California to Florida. “It is real freight being hauled for a real purpose,” said Mike Roeth, executive director of the North American Council for Freight Efficiency. Roeth said NACFE will track and verify Starship’s freight-ton efficiency during the trip, examining metrics such as elevation change, speed, weight and the wind. Shell will share the results at an event in Jacksonville, Fla., on June 5-6. During the test, AirFlow owner Bob Sliwa will drive the truck, and he said he will be focused on gauges, including a graphic interface that identifies fuel consumption. He also said he plans to coast whenever he can to maximize fuel efficiency. While NACFE will calculate the miles per gallon the truck achieves, Bob Mainwaring, Shell Lubricants technology manager for innovation and Starship technology lead, said it is not the most important metric. Shell has worked with AirfFlow on the project for more than three years, taking existing technologies and bringing them together in one place. “You might have seen any one item before, but you won’t see them all together,” Mainwaring said. The Starship features a carbon fiber cab with an aluminum roll cage, adaptive cruise control, a boat tail, an aerodynamic device to minimize the gap between the tractor and the trailer, and an active grille shutter system that closes when the engine doesn’t need the airflow to reduce aerodynamic drag. Ryan Forman, product manager for aerodynamics and engine encapsulation systems at Röchling Automotive, which developed the Starship’s system, said active grill shutters have been around for years, but interest has increased in the past two to three years. Mainwaring said the cost to build the truck is difficult to calculate because several companies were generous with their contributions. However, he said it was a small fraction of the money being invested into the SuperTruck program operated by the U.S. Department of Energy. Part of the efficiency gains with the Starship come from the lubricants it uses, and Shell provides a full line of lubricants, including a FA-4 full-synthetic heavy-duty engine oil in a 5W-30 weight. The lower viscosity provided better fuel economy than a conventional SAE 15W-40. Mainwaring said Shell is willing to engage in co-engineering relationships with OEMs to identify where frictional losses occur and design the appropriate lubricants. “Both of us end up with a better lubricant and a better lump of hardware,” he said. Toyota used the Make the Future event to showcase its hydrogen-powered Class 8 tractor the company developed for its operations at the Port of Long Beach. Craig Scott, director of the advanced technologies group for ‎Toyota Motor Sales USA, said the company spent about a year researching the truck and 10 months building it. The vehicle used a Class 8 truck chassis, two fuel cell stacks used in the Toyota Mirai hydrogen car and 12 kWh of batteries. It has 670 horsepower, 1,325 pound-feet of torque and can pull 80,000 pounds for 200 miles of range. Toyota’s truck has been in service for about six months and has accumulated 8,200 miles as of April 6, mainly moving parts from the port to Toyota’s warehouse. “We have started doing the L.A.-to-Ontario [Calif.] run, which is allowing us to collect data on high-speed freeway usage,” Scott said. Toyota will take the learning from this vehicle and apply it to a second truck it is developing, and the company has shared information with Hino Motors. Scott said Toyota watched competitors pop up as it was developing the technology. “It reaffirmed our strategy and theory that we were going in the right direction,” he said. Toyota expects the total cost of ownership to be “quite good” and thinks it would be possible to sell the truck for no more than a diesel truck, Scott said. “The total cost of ownership for fleets is what counts. They want to operate more, they want to operate faster, and they want to operate cheaper, and we think hydrogen gives them that opportunity,” he said. Toyota built a hydrogen refueling station at its facility to fuel the Class 8 tractor, and hydrogen is delivered to the facility. Toyota also has received a grant to build the world’s first megawatt-scale carbonate fuel cell power generation plant with a hydrogen fueling station to support its operations at the Port of Long Beach.